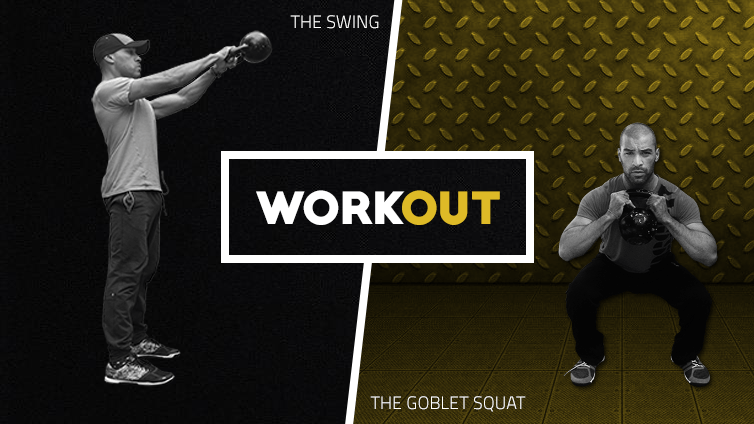 The kettlebell swing and the goblet squat are two fundamental exercises in kettlebell training. One exercise focuses on bending at the hips (hip hinging), while the other focuses on bending at the knees. One exercise focuses on strength (goblet squat), and the other focuses on power or force production (the kettlebell swing). The goblet squat targets your quads and glutes while challenging your core stability, as well as lower body flexibility and mobility. The kettlebell swing targets your hamstrings, glutes, lower back and shoulders while providing a metabolic workout. Through out my blog you will notice how I frequently include the kettlebell swing and goblet squat in a lot of the workouts. I do this because they deliver immense value, value that shouldn’t be ignored. If you don’t know or understand how to do a kettlebell swing or a goblet squat then watch the video below for some quick pointers. 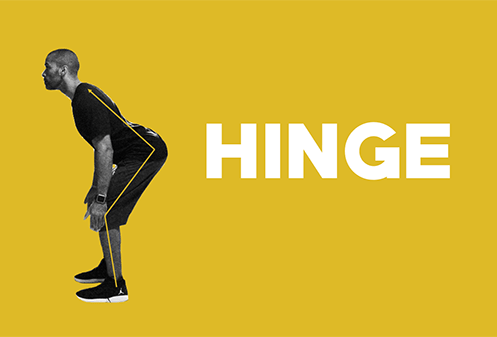 The “hinge” is not a squat. The hinge is the first thing you must learn in order to execute a powerful and injury-free kettlebell swing. There’s many reasons why someone will do a poorly executed kettlebell swing. I believe one of the main reasons is that they squat instead of hinge. As you learned in the video above, the hinge is a postural pattern where we are shooting our hips back to assist us in folding forward while keeping a neutral spine. 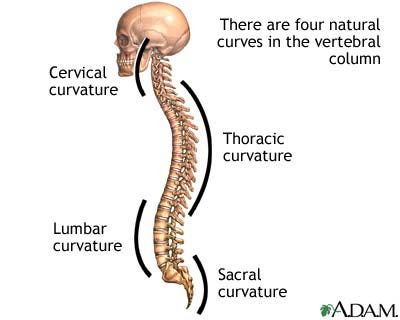 Neutral spine refers to when all the 4 segments of our spine are in their natural alignment. 1. You can apply the hinge in other important exercises, such as the deadlift, good mornings or bent over rows. 2. Integrating the hinge in your everyday movements will help save your back from injuries and discomfort. More specifically it can help you pick up objects from the floor by simply being more aware of your spine and by shooting your hips back as opposed to simply folding at your torso. In the following video I show you how a good and bad kettlebell swing looks like. With the bad swing you can clearly see that I am squatting. Notice how the bottom of the kettlebell is facing down as opposed to straight forward, this indicates I am using my shoulders to bring the kettlebell up as opposed to using my hips. With the good swing, you can see me hinging at my hips and having control of the kettlebell by keeping it very close to my body on the way down. Now you know the significance of these two exercises. Let’s take a look at a few ways on how we can build workouts around them. We are going to look at different rep schemes, exercise order, execution and rest periods. There’s definitely going to be at least one workout here that will be suitable for you. Pyramid training is where you start off with a particular exercise(s) and you either ascend or descend in repetitions. You can also use a time based model where you are doing work for a specified duration. In the following example (Pyramid A), you are going to start at the bottom of the pyramid, where you will be performing 30 kettlebell swings. You’ll then rest for 30 seconds and perform 30 goblet squats. You’ll proceed in climbing your way to the top of the pyramid. As you will notice, the volume of work decreases as you go up. Make sure to grab a kettlebell size that will allow you to complete the designated repetitions. If you are a beginner you may stop if you need to rest. Of course the goal is to complete the pyramid and to only rest at the proper segments. Complete this pyramid for 1-3 sets. Pyramid B is slightly more advanced as you will have to do more work. As soon as you reach the top you will continue in going back down (ascending in reps) to the base of pyramid. Complete this pyramid for 1-3 sets. Note: Let’s say you do this workout 1-2 times a week for 4-6 weeks. You want to make sure you progress this workout about every two weeks. So for example, you may want to complete the pyramid for 1 set (or 1x) in weeks 1 & 2. On weeks 3 & 4 complete the pyramid 2x and 3x on week 5. 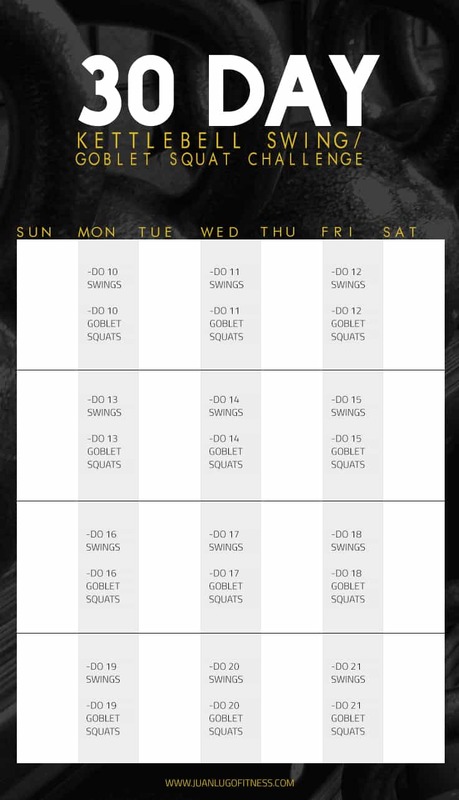 On week 6 go back to completing it only once but this time choose a heavier kettlebell. Who doesn’t enjoy a good challenge? 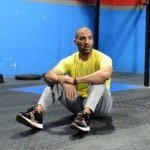 Instead of dedicating an entire workout to these two exercises, we are going to distribute them into smaller portions through out 30 days. Don’t treat this challenge as a workout. Treat it as complimentary mini workouts to assist your fat loss and muscle building efforts. This a great way to add up movement, caloric expenditure or physical activity to your day and month. EMOM workouts are deceptively grueling. EMOM stands for Every Minute On the Minute. A EMOM consists of doing an exercise at the beginning of that minute for a specified repetition range and resting for the rest of that minute. Make sure to begin on every minute, on the minute. This is your first EMOM. You have to perform 15 repetitions of kettlebell swings and goblet squats. . The quicker you complete your exercises the more time you will have to rest. 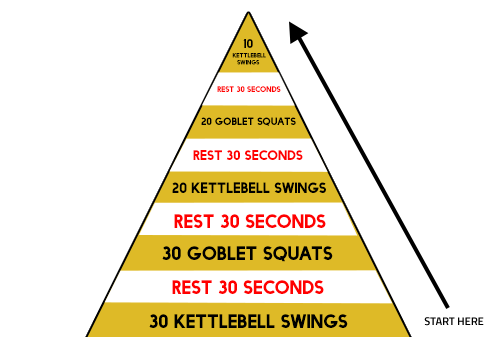 So If you take 20 seconds to complete 15 kettlebell swings then you will have 45 seconds to rest. Forty five seconds might seem like a lot of time to rest but the fatigue will surely catch up with you as you move up on your set. Just as with the pyramid sets, simply completing this workout week after week isn’t enough. You want to progress your conditioning. Weeks 1-2: Complete EMOM A 2x. 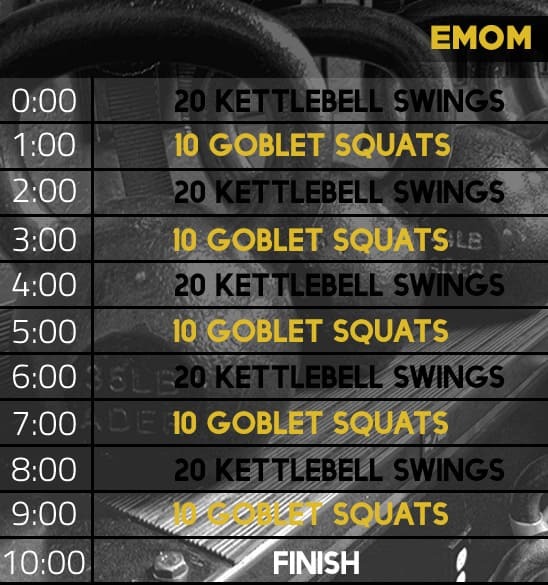 Weeks 3-4: Complete EMOM A 2x but choose a heavier kettlebell. Week 5: Week 5 is optional. 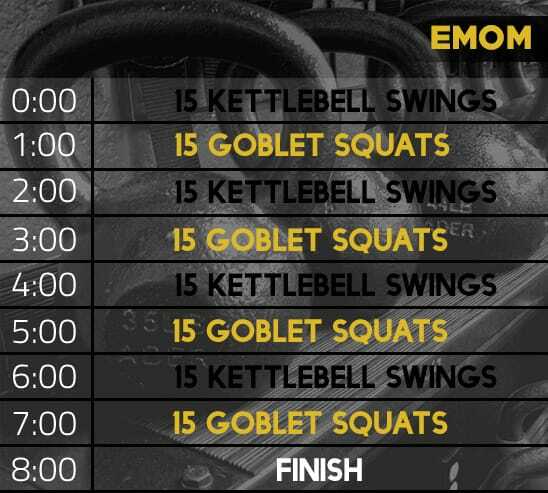 In week 5 you will be doing just 10 goblet squats but 20 kettlebell swings and the workout will last 10 minutes instead of 8. There’s tons of other exercises in the kettlebell kingdom that are more advanced than these two. However this post was about keeping it basic. Basic does not imply easy. Done with proper form these exercises can become very demanding. What’s so great about these workouts is that you don’t need any fancy equipment or a lot of space to do them. They will help you burn fat and build muscle at the same time. If you have any questions about the exercises or the workouts please leave them in the comment section below. Thanks for stopping by and happy training.